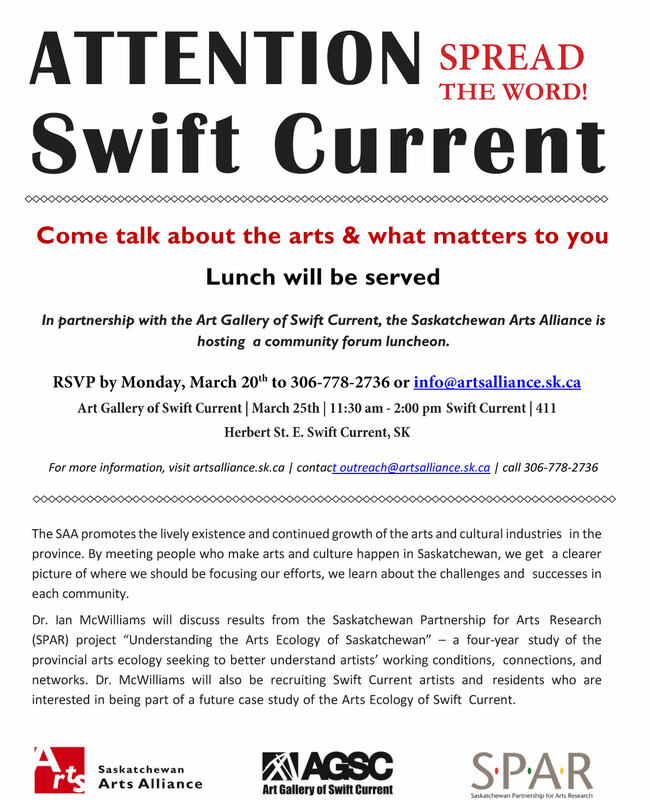 In partnership with the Art Gallery of Swift Current, the Saskatchewan Arts Alliance is hosting a community forum luncheon. The SAA promotes the lively existence and continued growth of the arts and cultural industries in the province. By meeting people who make arts and culture happen in Saskatchewan, we get a clearer picture of where we should be focusing our efforts, we learn about the challenges and successes in each community. Dr. Ian McWilliams will discuss results from the Saskatchewan Partnership for Arts Research (SPAR) project “Understanding the Arts Ecology of Saskatchewan” – a four-year study of the provincial arts ecology seeking to better understand artists’ working conditions, connections, and networks. Dr. McWilliams will also be recruiting Swift Current artists and residents who are interested in being part of a future case study of the Arts Ecology of Swift Current.